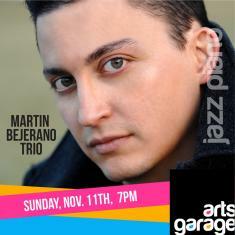 Sunday November 11 at 7 PM: Arts Garage presents the Martin Bejerano Trio. Bejerano has been active as a professional musician from the age of fifteen. A world-class jazz pianist and composer, Martin has been a member of Grammy Lifetime Achievement Award winner Roy Hayne's quartet for fifteen years. He has also performed and/or recorded with such jazz luminaries as Christian McBride Band, Dave Holland, Pat Metheny, Ignacio Berroa, Ron Carter, and Russell Malone, performing at most of the major jazz clubs, festivals, and venues around the world. An award-winning bandleader, Martin's trio has performed at such notable venues as Symphony Space, Festival Miami, Dizzy's Club Coca-Cola, The Jazz Gallery, Barquisimeto Jazz Festival, El Hatillo Jazz Festival, St. Petersburg Jazz Festival, and Arturo Sandoval's Jazz Club, and was recently featured on NPR's "Jazz Set", a nationally syndicated radio show that spotlights jazz artists. Their recent CD release, Trio Miami, was awarded "Editor's Choice" by Downbeat magazine (2016). 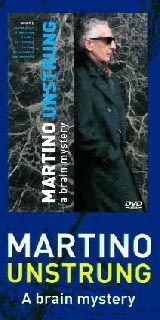 Martin has also gained notoriety as an award-winning composer. He has been twice awarded the prestigious "New Jazz Works" grant from Chamber Music American in 2010 and 2017 and, was also awarded the "Bacardi Choice" Commission by Bacardi and the Dranoff 2 Piano Foundation in 2014. This evening the trio will be premiering a new work, "Cuban American Suite", that was commissioned by Chamber Music America with generous support from the Doris Duke Charitable Foundation.